I heart coffee. Not that I recall my first cup or anything. Perhaps in the college dining hall? In France? Milky coffee with a chocolate digestive biscuit in an English tea room? I’m not a tea drinker, despite the genes. Dunkin’ Donuts holds memories for me. As a little kid living in New Jersey, we spent many Sundays eating at Dunkin’ Donuts. Whether it was on our way to or from Fabricland or Carpetland or whatever store my parents were dragging my sister and I to, there was often a stop at Dunkin’ Donuts. While my parents drank…probably coffee…I ate a bowl of Manhattan Clam Chowder or Minestrone. A finished bowl of soup meant I could choose a donut. My all-time fave as a kid was either the Boston Cream or the jelly filled. As an adult I am a Chocolate Cake donut fan. But, getting back to coffee… I was sent several bags of Dunkin’ Donuts coffees to try. The coffees are packed in shiny bags…perfect for holiday gift giving. Now that I have one child in elementary school, I can afford to spend a little more on teacher’s gifts. My middle schooler and high schooler balk at giving gifts to their teachers. They like their teachers, but I think that when you are 11 or 12 or 14 handing a gift to a teacher in front of your classmates is all sorts of embarrassing. So, I don’t force my tween or teen to bring in teachers’ gifts. My son, though, loves hauling all the gift bags on the school bus and doling the presents out to his teachers. 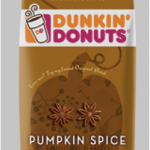 This year I will buy bags of Dunkin’ Donuts holiday flavored coffees along with a colorful coffee mug or maybe a box of cookies for our teachers. I wrote this review while participating in a blog tour campaign by Mom Central on behalf of Smuckers and received necessary products to facilitate my review. In addition, I received a gift certificate to thank me for taking the time to participate. The views expressed in the post are my own. ← Spouses: Master Bedroom or Separate Bedrooms?